Oooh, I just love her so much! 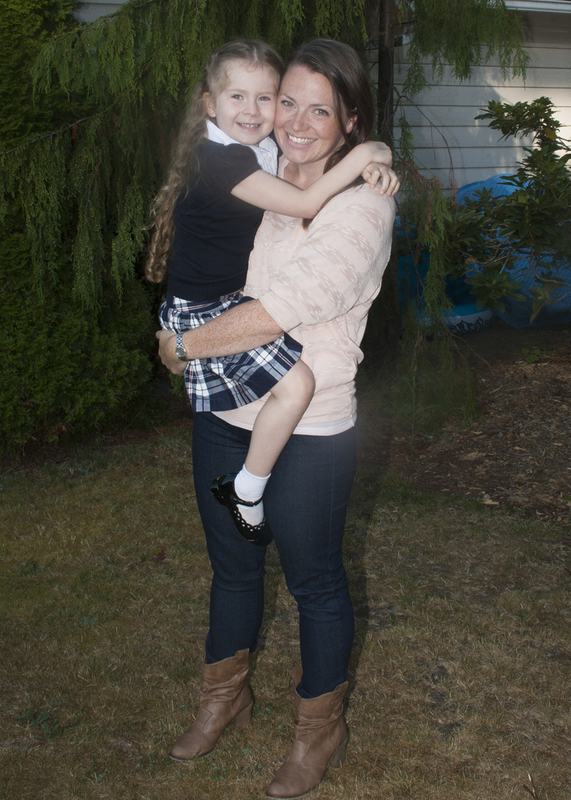 I’ll go on record and say that I did not cry when she walked away from me at school her first day. It’s well documented that I have no soul (really, most of my friends agree on this point). I didn’t cry during Terms of Endearment. If you’re like me and think all the characters in that movie are horrible, that may not seem that bad. Even I have to admit that when you take into account that I was pregnant the first (and only) time I saw it, it seems a little heartless. I secretly (not so secret now) thought it would serve them right if the lion attacked the guys at the end of this video. And, I think Bambi’s little friend Thumper is supremely annoying. These are only a few examples of the soulless existence I lead. So, it really shouldn’t shock those who know me that I didn’t well up with tears when Madison skipped after her teacher towards her classroom. 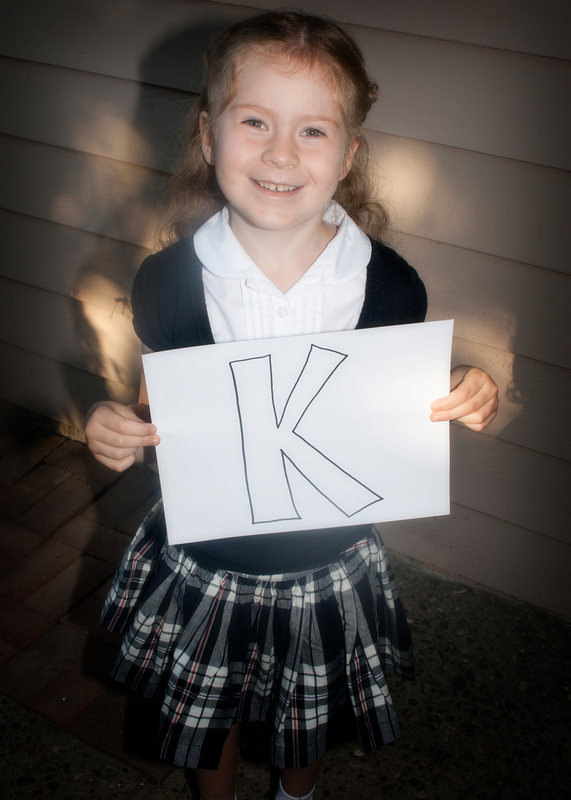 With a jaunty wave and a shout of “See you when I come home on the BUS!”, my baby girl left her preschool years behind her…and I nearly burst with pride. But not tears. While we were school shopping at the local outlet mall, I smelled the unmistakable scent of chocolate on the air. I followed my nose to The Rocky Mountain Chocolate Factory store. There, I was tempted to buy a confection that looked like nothing I’d ever seen – an Avalanche Bar. 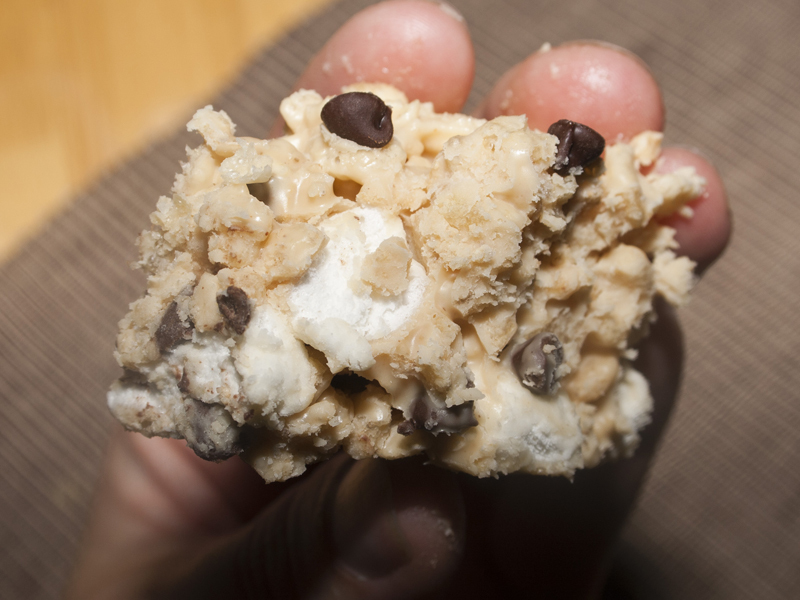 Only my empty pocketbook and hands laden with a dozen full shopping bags kept me from forking over the close to $4 for a square of what looked like a rice krispie treat on crack. I came home and immediately put my computer to good use finding a copycat recipe. These babies are rich and absolutely decadant. 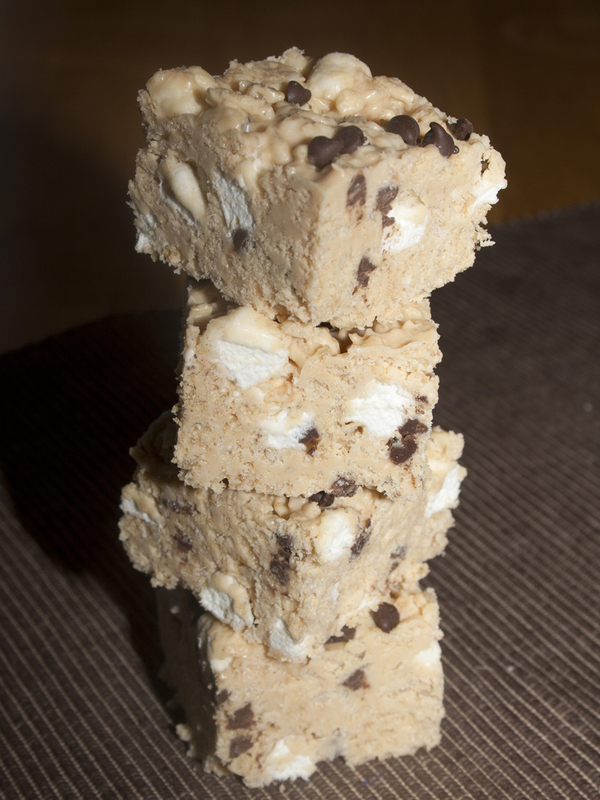 They are full of white chocolate, marshmallows, chocolate chips, peanut butter and a little crunch from rice krispies. They actually reminded me of my crispy peanut butter balls, but without all the rolling and dipping. You start with some white chocolate and melt it up. I tweaked the recipe and added a wee bit of butter to this step because the original blogger mentioned that if you press them into the pan too firmly, they’ll get hard. It worked! Mine didn’t have any firmness problems! 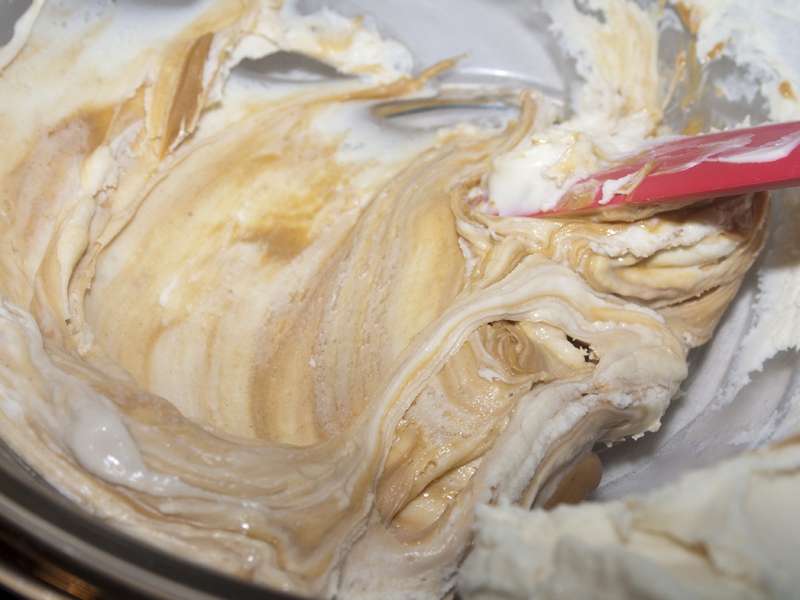 Then, you stir in peanut butter until it’s all combined. 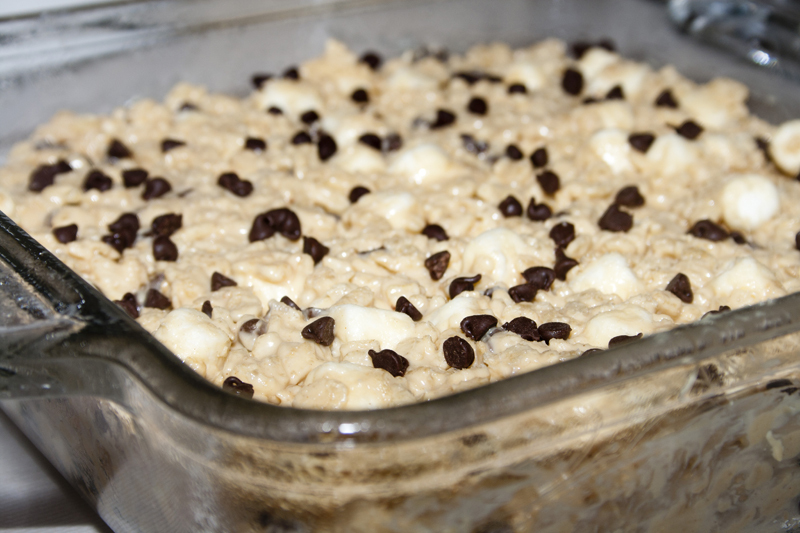 Add some rice krispies and let it cool for a bit. You’ll be stirring in ingredients that could melt, so you need a little patience or it’ll all just blend together. 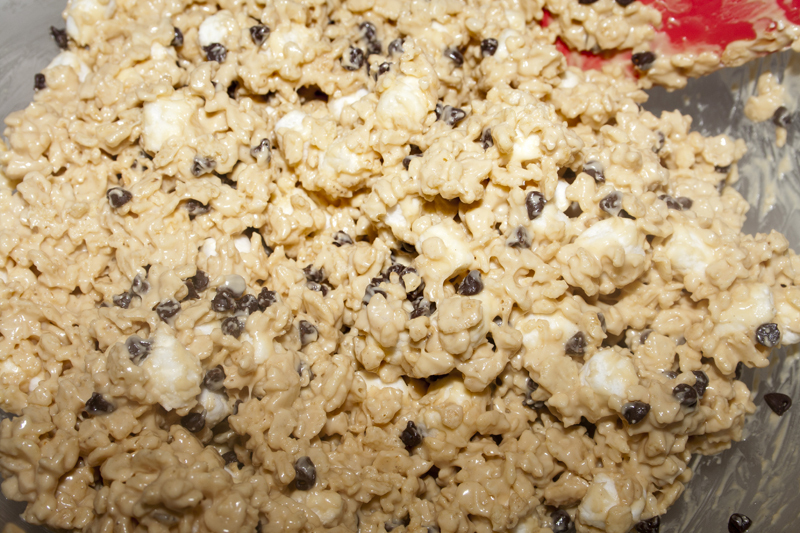 Once your chocolate mixture has cooled, add mini chocolate chips and marshmallows. Taste test for poison at this point. You gotta protect the ones you love. 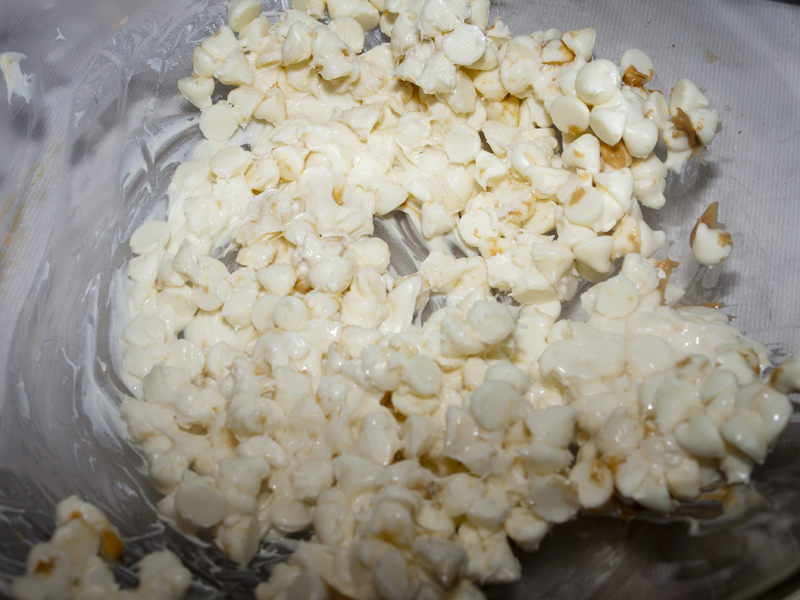 Then press into a pan and sprinkle some more mini chips on top. You may have to steal another spoonful…you know, just to get it to fit right in the pan. Allow to cool and cut into squares. Devour. Incredible. An avalanche of flavor. Rich chocolate, sweet mallow, the salty kick of peanut butter. Oh baby. Glorious! Do not share these with anyone who does not have a sweet tooth. (ahem…Zack!…cough) They just won’t appreciate this kind of deliciousness. But you will. Trust me. 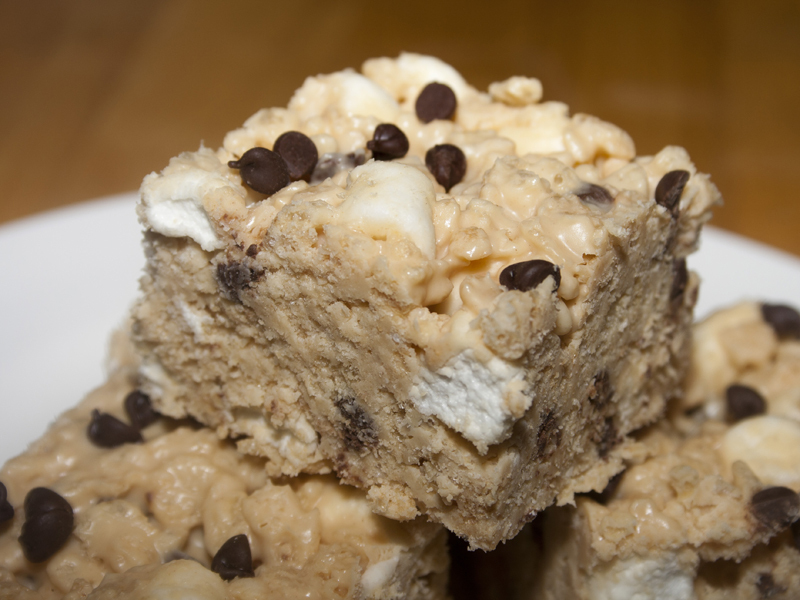 They are phenomenal no-bake amazingness. Lightly grease a 9×9 pan. In microwave-safe bowl pour in white chips and heat on 50% power for 1 minute. Add butter. Stir and continue in 30 second increments until chips & butter are melted together. 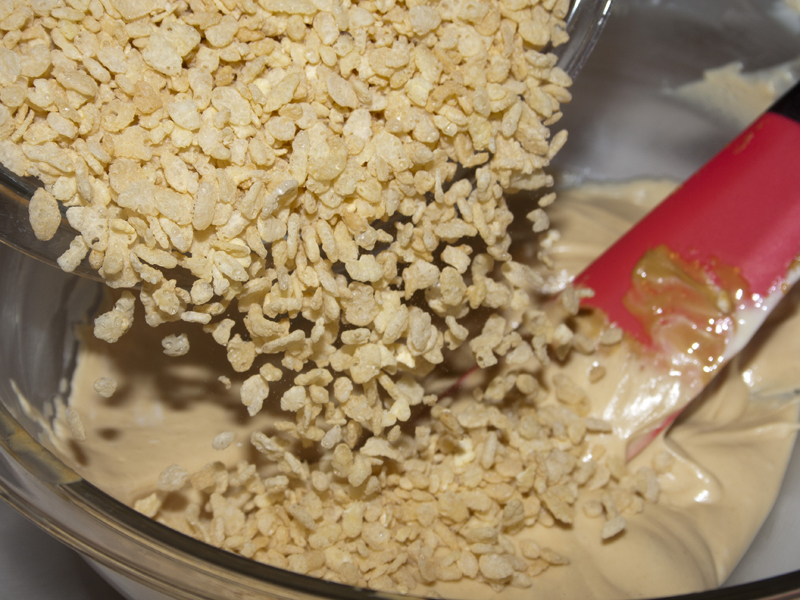 Pour mixture into the prepared pan and spread evenly, pressing lightly with the back of your spoon. you are so fun – love reading your blog – am printing this recipe now – cheers! oh – and btw – your little madison is adorable!! Thanks Karole! I think she’s pretty adorable too! Glad you enjoy Bakerlady. 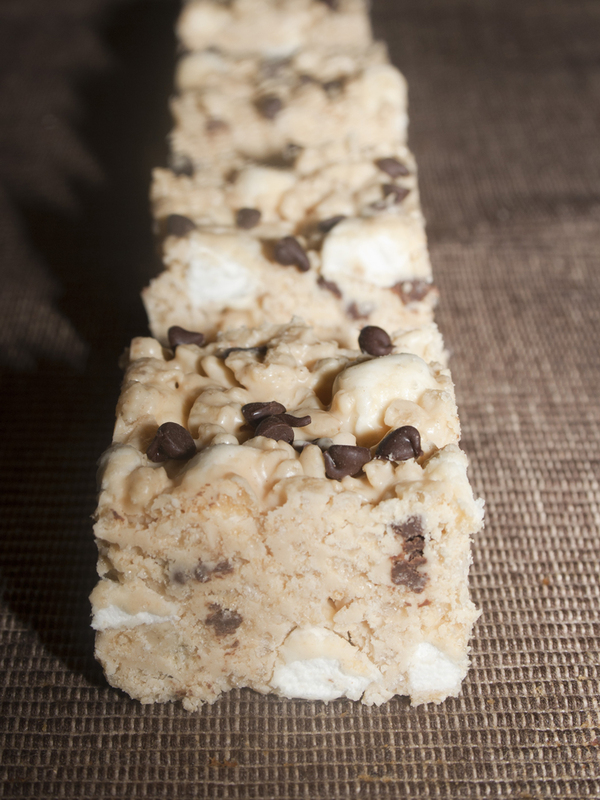 🙂 You’ll love these bars! You will be happy to know that the effects of the poison can be counteracted by the addition of more chocolate chips. But just to be sure, I made certain to test them again when they were cooled. Everyday I see your posts and then I know what new thing I am cooking that day. I wish you and your daughter the very best for her school experience. Double taste test. Well done you! 🙂 Thanks for the well wishes! if i make them on thursday will they still be good to eat on friday or better fresh? I ate on them for almost a week and they were still delicious. Just keep them sealed.